“Apollo Receiving the Shepherds’ Offerings” by Gustave Moreau (1895). 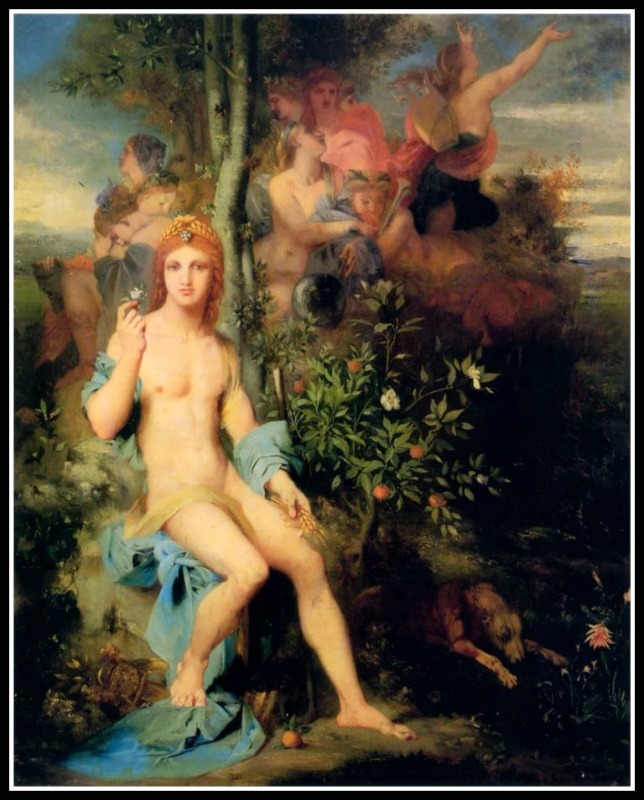 Apollo was the son of Zeus and Leto. The Roman worship of Apollo was adopted from the Greeks. Apollo had no direct Roman equivalent, although later Roman poets often referred to him as Phoebus. Apollo had a twin sister, Artemis, the Goddess of Hunting. Mythographers agree that Artemis was born first and then assisted with the birth of Apollo, or that Artemis was born one day before Apollo, on the island of Ortygia and that she helped Leto cross the sea to Delos the next day to give birth to Apollo. As the patron of Delphi, Apollo was an oracular go, the prophetic deity of the Delphic Oracle. As the god of prophecy. Apollo exercised this power in his numerous oracles, and especially in that of Delphi. The source of all his prophetic powers was Zeus himself and Apollo is accordingly called “the prophet of his father Zeus”. 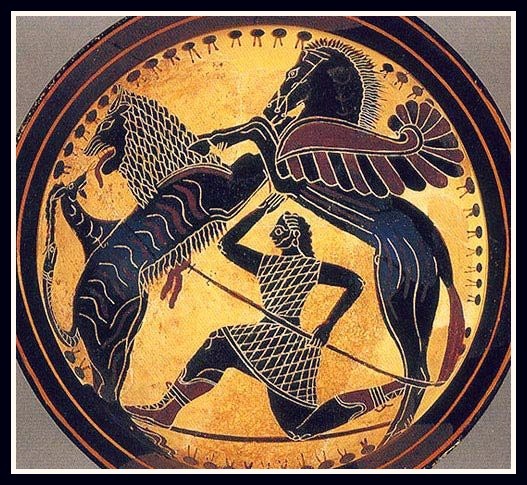 According to Apollodorus, the oracle had previously been in the possession of Themis, and the dragon Python guarded the mysterious chasm, and Apollo, after having slain the monster, took possession of the oracle. 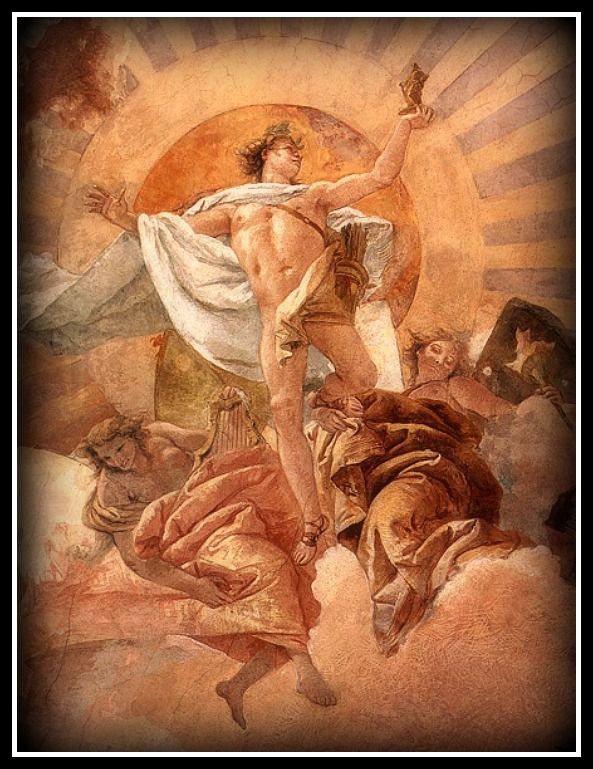 Apollo was also known as “the god who affords help and wards off evil”. He had the power of visiting men with plagues and epidemics, so he was also able to deliver men from them. Apollo was furthermore depicted as the God of Music. This is shown particularly on the Iliad, in which he appears delighting the immortal gods with his play on the phorminx during their repast. Besides, the Homeric bards derived their art of song either from Apollo or the Muses. He was also considered a God related to the Foundation of Towns. His assistance in the building of Troy was very important, respecting his aid in raising the walls of Megara. 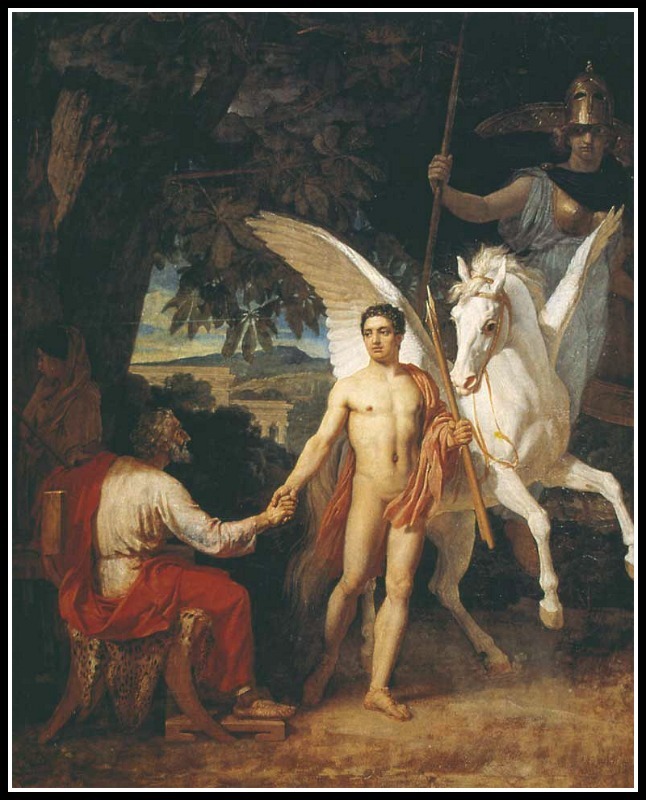 Medicine and healing were associated with Apollo too, whether through the god himself or mediated through his son Asclepius. Coronis was Apollo’s lover and Asclepius’ mother. She was a princess of the Thessalian kingdom of Phlegyantis. When she was pregant with his son, Coronis committed adultery with a man named Ischys (“the Mighty”). Apollo knew it as he had commanded his divine messenger, the white raven, to guard Coronis. When the raven brought news to Apollo of his lover’s infidelity, the god, angered at the bird, turned the raven’s white feathers black. Apollo killed Ischys and sent his sister, Artemis, to destroy her. Apollo’s sister, Artemis, slew Coronis with her deadly arrows. 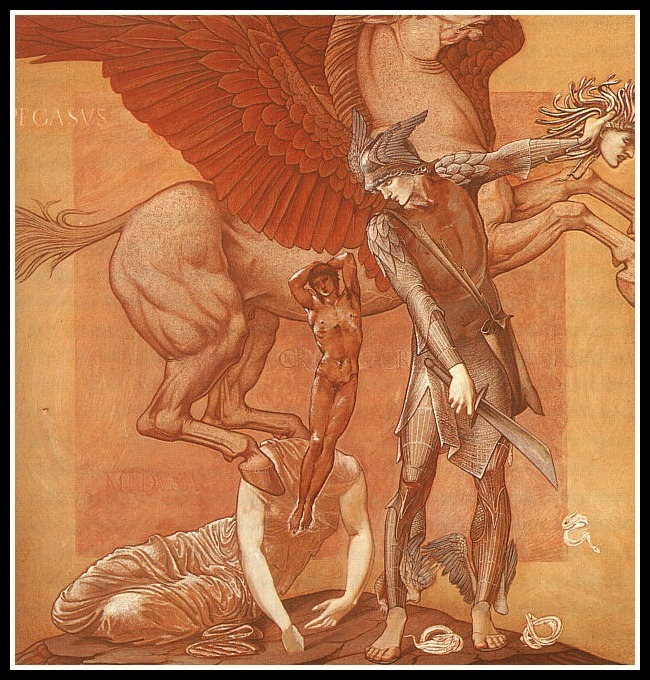 Whilst Coronis was burning on the pyre Apollo made sure to remove his son (Asclepius) from her womb and he gave it to the Chiron, (son of Cronus, Zeus’ Father and God of time and the ages, and the Oceanid Nymph, Philyra), who was as the eldest and wisest of the Centaurs, a tribe of half-horse men. 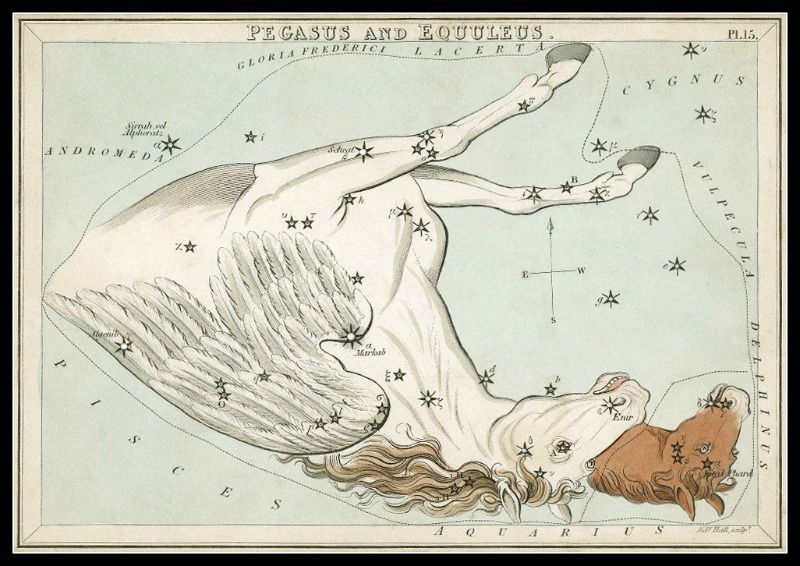 Coronis was later placed amongst the stars as the constellation Corvus (“the Crow”). 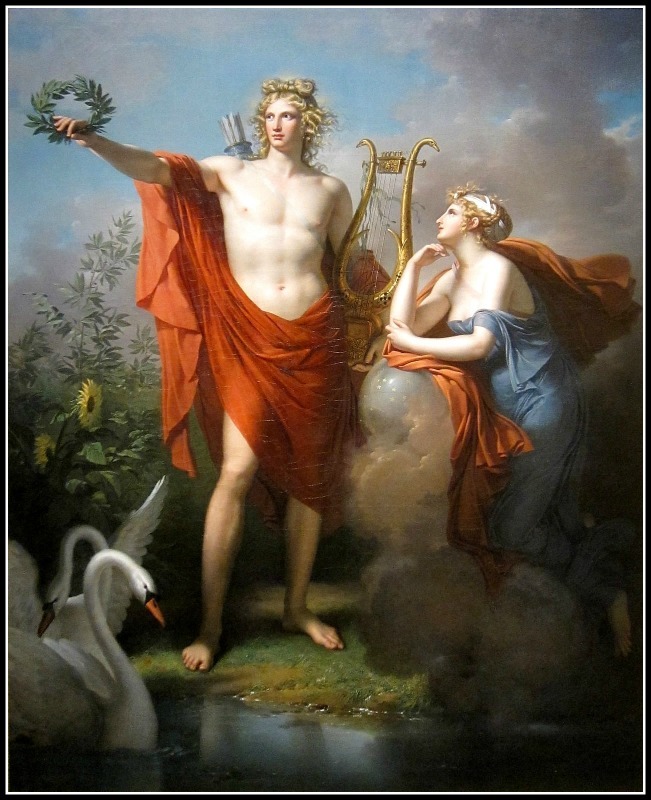 In Hellenistic times, especially during the 3rd century BCE, as Apollo Helios he became identified among Greeks with Helios, God of the Sun, and his sister Artemis similarly equated with Selene, Goddess of the Moon. 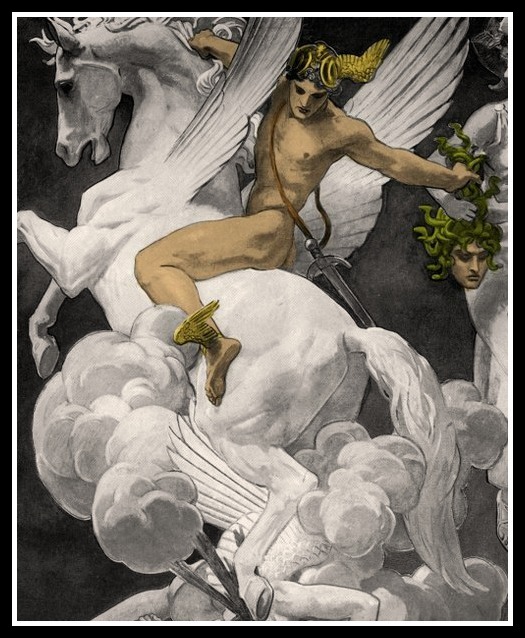 Furthermore, the Horae could be related to the portions of time of the Day (twelve hours for the Ancient Greeks) These Horae oversaw the path of the Sun-God Helios (Apollo) as he travelled across the sky, dividing the day into its portions. Apollo was worshipped throughout the Roman Empire. In the Celtic lands he was most often seen as a Healing and Sun God. 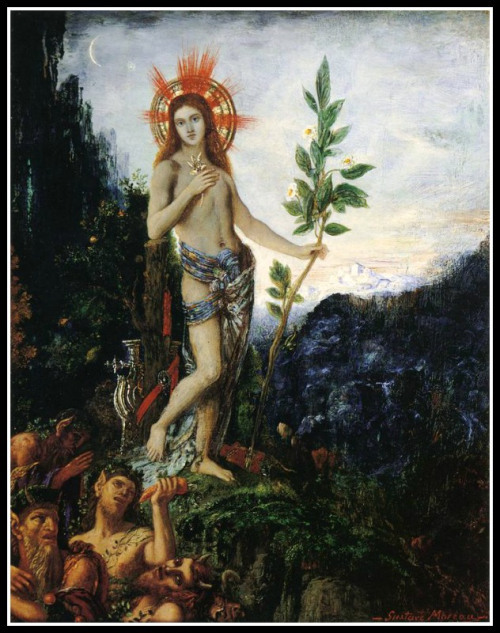 “Apollo and The Nine Muses” by Gustave Moreau (1856). “Apollo with Urania, Muse of Astronomy” by Charles Meynier (1800). but heed my voice of light turned dark, receive my weary cry! set her singing through my clumsy mouth, and please do not refuse. in crowded towns or fields we sow. unveiling only for the dead? to see with courage what we find! we sing, and hope to love. to drown the heat in giving song. a teapot is not much to blame. to turn to song our feeling sad? in love and gratitude uplift. in music we are not alone. but heed this voice of light turned dark, receive our weary cry! set her singing through our clumsy mouths, and please do not refuse. Geofrey dixit: I am an apprentice poet and fiction writer, working to learn the skill of turning life into words, and the even greater skill of turning words into life. I love pretty pictures, distant dreams, and silent sleep. More than anything else I am a lover of words, of the way words can bring us together and allow us, so briefly, to feel ourselves echoed in another’s thoughts. I write because literature can lift us out of ourselves, put us into another person’s mind, and, for a moment, reconcile us to our so solitary condition. If I can learn to do that, maybe in some small way I’ll have justified a part of my existence. •Make sure to visit Geofrey’s Blog, The Giggling Stream. •Feel Free to connect with Geofrey at: Twitter, Facebook and Google Plus. And my Brief Story “Otro Cortado” has been featured on Page 40. Y, mi relato “Otro Cortado” ha sido publicado en la Página 40. Revista Salto al reverso #7 (Click!). Salto al Reverso #7. Click on the image above to Read. Hacer Click para leer. Salto al Reverso #7. Click and Scroll down to page 40 to read my brief story. Hacer Click e ir a la página 40 para leer mi relato. My blogger friends Sylvester from Syl65’s Blog and Marlyn from Kintal have invited me for a so called 3-Day Quote Challenge. 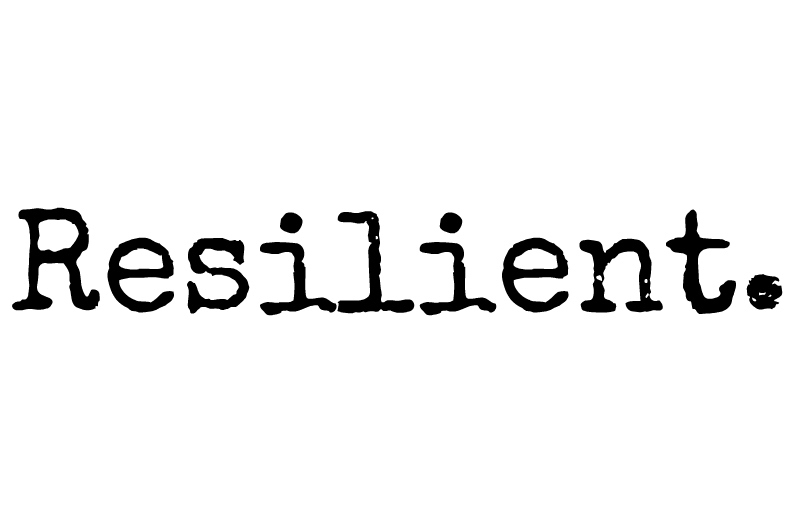 The rules of the challenge are: ♠Post your favorite quotes or your own quotes for three (3) posts in a row. 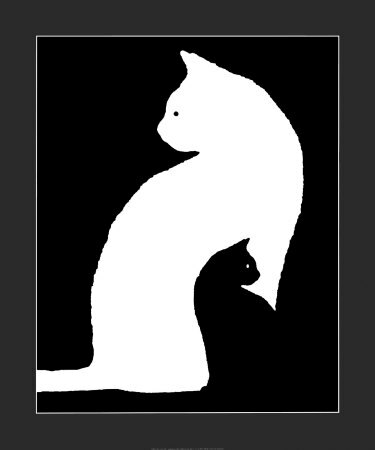 ♠Thank the person who nominated you. ♠Pass it on to three (3) other bloggers per quote, each time you post them. Or pass it to nine (9) bloggers if you choose to post all the quotes together, in the same post. My nominees for the Quote Challenge are: 1. Deanne’ s World 2. The Girl Has No Name 3. An Elephant Called Buddha 4. Mumbai Metro Mess 5. The Raven’s Nest 6. Mithai Mumblezz 7. Fiesta Estrellas 8. Before Sundown 9. Send Sunshine. I would like to thank bloggers from Emmanuel Muema’s Blog, Don’t Cha Wanna Dream and Belinda Crane for nominating my blog for a Creative Blogger Award, and two Sisterhood of The World Bloggers Awards, respectively. I. Nominees for the Creative Blogger Award: 1. Great Indie Authors 2. Debi Riley 3. A Blog Less Traveled 4. Travel Tales of Life 5. Nicodemas 6. UsefulSoul 7. Belinda Crane 8. Geo Kalpataru 9. Don’t Cha Wanna Dream 10. Badfish Out of Water. II. Nominees for the Sisterhood of The World Bloggers Award (I): 1. Sacred Touches 2. Poetheart 3. Tales from the Fairies 4. Debbie Robson 5. Raine Fairy 6. Big Body Beautiful 7. Peaceful Warrior 8. Spicy Road 9. Of Opinions 10. Cappy Writes. III. Nominees for the Sisterhood of The World Bloggers Award (II): 1. Scattered Thoughts 2. Le Carnet de Dame Catherine 3. LDG Luciledegodoy 4. Loren Photography 5. Emmanuel Muema’s Blog 6. Annina Luck Wildermuth 7. Rosie Amber 8. No Wasted Ink 9. The Axis of Ego 10. Monica Byrne. The Charites (Three Graces) were reputed to be the essence of beauty, charm, and grace and were associated with the Nine Muses, who presided and inspired arts and sciences. The Charites were three goddesses, who were sisters between them: Aglaia (Αγλαια Brightness), Euphrosyne (Ευφροσυνη Joyfulness), and Thalia (Θαλια Bloom). They are said to be daughters of Zeus and Hera (or Eurynome, daughter of Oceanus) or of Helios and Aegle, a daughter of Zeus. The Charites were also joined in the banquets, celebrations by the Horae who were the keepers of the gates to Mount Olympus. Aglaia was the charis goddess of beauty, adornment, splendor and glory. Aglaia was a the wife of the god Hephaistos and like her she represented the creation of objects of beauty and artistic adornment. Thalia was the charis goddess of festive celebrations and rich and luxurious banquets. Frequently the Graces were taken as goddesses of charm or beauty in general and hence were associated with Aphrodite, the goddess of love; Peitho, her attendant; and Hermes, a fertility and messenger god. As attendants of Aphrodite they were goddesses of personal beauty and the adornments which enhanced this: makeup, oils, perfumes, fine clothing and jewellery. The Charitesia were annual competitions and games in honor of the Graces. There were athletic competitions, literary, musical and dramatic contests (which took place in the theater). The Charitesia festival was held at Orchomenos near the modern town of Kalpaki. I want to thank Shehanne Moore for nominating me for a Lovely Blog Award. Shehanne is an scottish blogger and author of “Smexy Historical romance”, “the Unraveling of Lady Fury” and “Loving Lady Lazuli”, among others. Meet Shehanne at her blog. I also want to thank D.G. Kaye for nominating me for this same Award. Please make sure to check out her author blog. 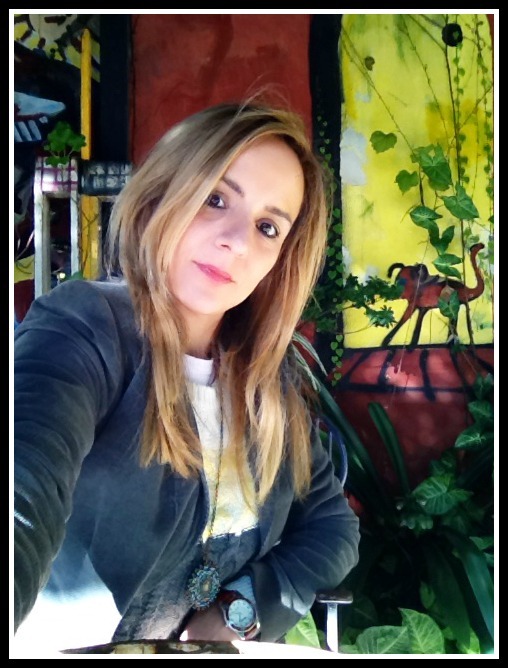 She is a canadian author and has published “Conflicted Hearts”, “Meno-What?, a Memoir” and “Words We carry”. You can also take a peek on my latest post in which I featured her new book “Words we Carry”. In this occasion, I will nominate -in no particular order- new followers and/or great bloggers I have recently met or that I haven’t nominated yet. 1. Medgekorne 2. Kely has a Blog 3. Sacred Touches 4. A Universal Life 5. Dennis’ Diary of Destruction 6. Strings of Soulfulness 7. Meditation Travelogue 8. Ombreflessuose 9. Tavolozza di Vita 10. Dotedon. Thanks D.G Kaye and Shehanne Moore for this Award. 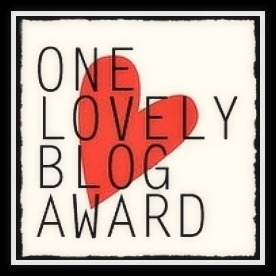 By the way, I love the way Shehanne Moore featured my Lovely Blog Award nomination at her blog. 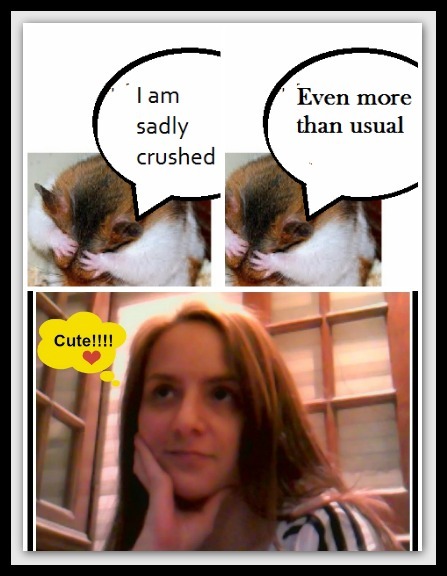 Source Hamsters Images: Source: http://shehannemoore.wordpress.com/2014/11/07/one-lovely-blog-award/. The third one is mine (moi). The Horae were the goddesses of the seasons and the natural portions of time. They were originally the personifications of nature in its different seasonal aspects, but in later times they were regarded as goddesses of order in general and natural justice. Pursuant to Homer, who neither mentions their parents nor their number, they are the Olympian divinities of the weather and the ministers of Zeus; and in this capacity they guard the doors of Olympus, and promote the fertility of the earth, by the various kinds of weather they send down. Thy were also the ones who discovered Aphrodite soon after her sea-foam birth and saved her. The Horae are mentioned in two senses in Hesiod’s “Theogony” and the Homeric Hymns. ►First Triad: In one variant emphasizing their fruitful aspect, Thallo (Spring or new shoots), Auxo or Auxesia (Spring Growth, which equals to Summer), and Carpo (Autumn). 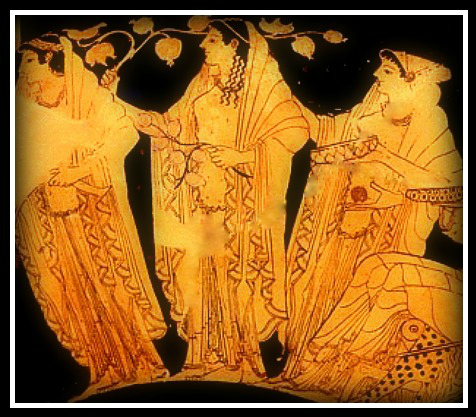 They were the goddesses of the three seasons the Greeks recognized: Spring (Thallo), Summer (Auxo) and Autumn (Carpo). As the Horae were conceived to promote the prosperity of every thing that grows, they appear also as the protectresses of youth. Jane Ellen Harrison asserts the existence of female trinities, discusses the Horae as chronological symbols representing the phases of the Moon and goes on to equate the Horae with the Seasons, the Graces and the Fates and the three seasons of the ancient Greek year. The Hora of Spring, Thallo, accompanied Persephone every year on her ascent from Hades’ Underworld to meet his mother Demeter. According to one of the Homeric Hymns, the attributes of spring-flowers, fragrance, and graceful freshness are accordingly transferred to the Horae; thus they adorned Aphrodite as she rose from the sea, made a garland of flowers for Pandora, and even inanimate things are described as deriving peculiar charms from the Horae. ►Second Triad: In this variant, emphasising the “right order” aspect of the Horae. They were three Goddesses called Dike, Eunomia, and Eirene. These three Horae were law-and-order goddesses that maintained the stability of society and were worshipped primarily in the cities of Athens, Argos and Olympia. •Eunomia was the goddess of law and legislation. The same or a different goddess may have been a daughter of Hermes and Aphrodite. •Dike was he goddess of moral justice: she ruled over human justice, as her mother Themis ruled over divine justice. According to myths, Zeus placed her on earth to keep mankind just, he quickly learned this was impossible and placed her next to him on Olympus, as the Greek constellation called The Maiden. •Eirene was the personification of peace and wealth. •Note regarding the number of Horae: The number of the Horae differs according to the sources, though the most ancient number seems to have been two (Thallo and Carpo). But afterwards their common number was three. Quintus Smyrnaeus makes Helios and Selene (the Sun and Moon) the parents of the Horae, goddesses of the seasons. 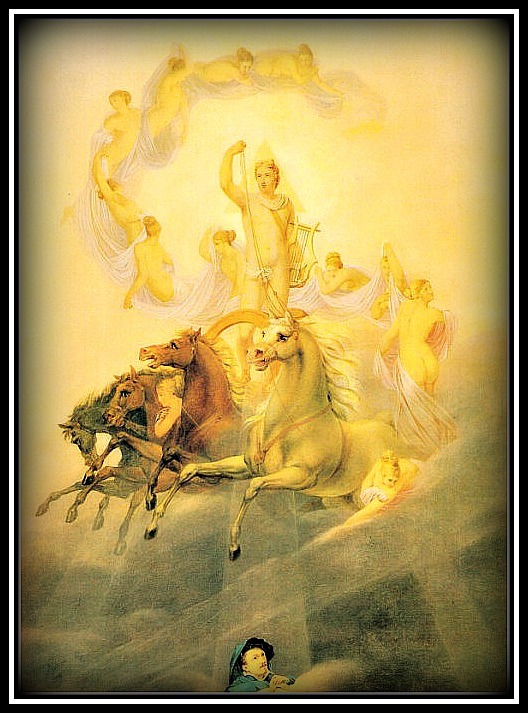 In this account of Helios’ myth, the Horae were the four handmaidens of Hera (Zeus’ wife). According to this version, their names were: Eiar (Spring), Theros (Summer), Phthinoporon (Autumn), and Cheimon (Winter). Hyginus (Fab. 183) is in great confusion respecting the number and names of the Horae, as he mixes up the original names with surnames, and the designations of separate seasons or hours. In this manner he first makes out a list of ten Horae (Titanis, Auxo, Eunomia, Pherusa, Carpo, Dice, Euporia, Eirene, Orthosia, and Thallo), and a second of eleven (Auge, Anatole, Musia, Gymnasia, Nymphes, Mesembria, Sponde, Telete, Acme, Cypridos, Dysis). ►In another different variant the Horae were not related with seasons but to the portions of time of the Day, twelve hours for the Ancient Greeks. The ancient Greeks divided the hours of daylight into twelve portions, identified by the position of the sun in the sky. In this sense, the Twelve Horae were Goddesses of the hours of the day and perhaps also of the twelve months of the year. These Horae oversaw the path of the Sun-God Helios as he travelled across the sky, dividing the day into its portions. The Twelve Horae were not always clearly distinguishable from the Horae of the Seasons, who were also described as overseeing the path of the sun. •Mousika, the morning hour of music and study. •Gymnastika, the morning hour of gymnastics/exercise. •Nymph, the morning hour of ablutions (bathing, washing). •Sponde, libations poured after lunch. •Elete, prayer, the first of the afternoon work hours. •Akte, eating and pleasure, the second of the afternoon work hours. by Giovanni Battista Tiepolo (1752-53 ). Description: Apollo (Helios) has left his palace and is floating slowly downward, accompanied by two of the Horae, while the rising sun shines out behind him. Sun rising over the Earth, symbolized by the surrounding Continents. The sun appears as a life-giving force which determines the course of the days, months and years. 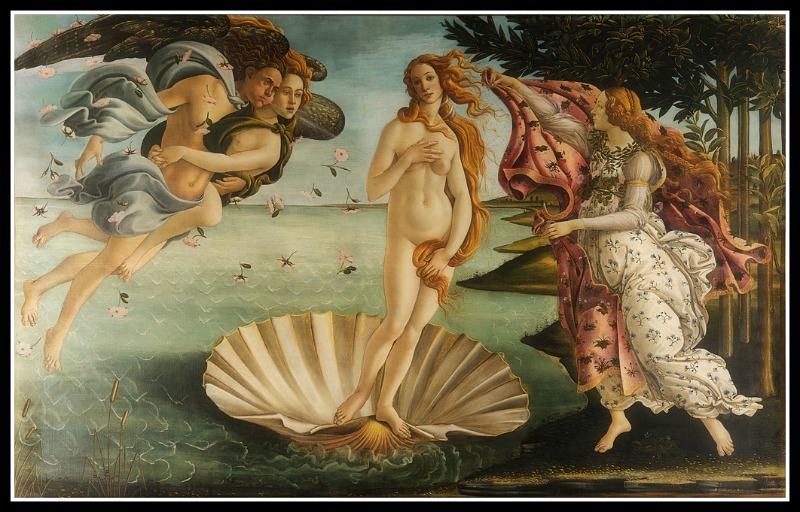 “The Birth of Venus” by Sandro Botticelli (1486). “The Birth of Venus” by Sandro Botticelli (1486). Detail. On the Right: One of the Greek Horae waits for Aphrodite with a flower covered robe . 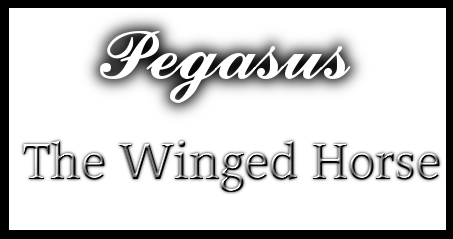 Description: The wind gods Boreas and Zephyrus waft the Goddess of Love to shore. There, one of the Horae, probably Thallo, who represented Spring, waits to receive Aphrodite (Venus) as she spreads out a flower covered robe in readiness for the Love Goddess’ arrival. The picture hung in the country villa of the Medici along with “Primavera” (see painting below), indicating that the work was commissioned by the Medici family. 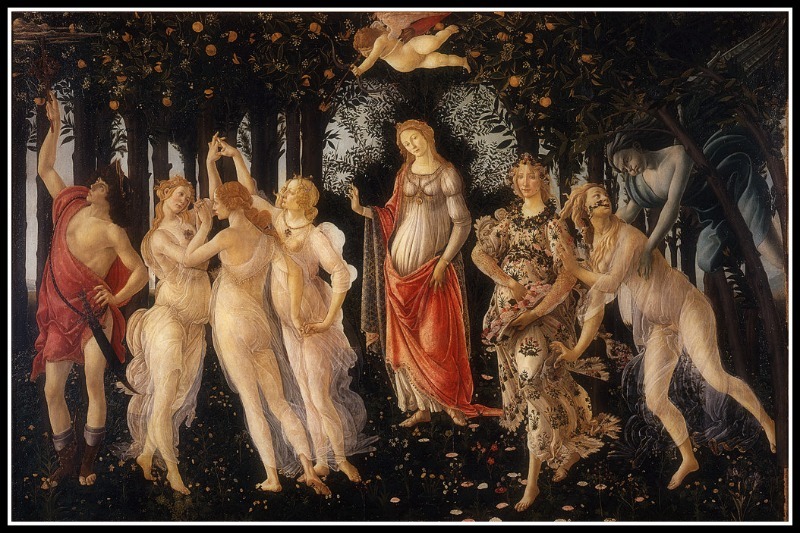 “Primavera” by Sandro Botticelli (1482). Description: This painting depicts a tale from the fifth book of Ovid’s “Metamorphoses” in which the wood nymph Chloris‘ charms attracted the first wind of Spring, Zephyr. Zephyr pursued her and as she was ravished, flowers sprang from her mouth and she became transformed into Flora, goddess of flowers. Aphrodite presides over the garden – an orange grove (a Medici symbol). She stands in front of the dark leaves of a myrtle, which was a sacred plant to her. 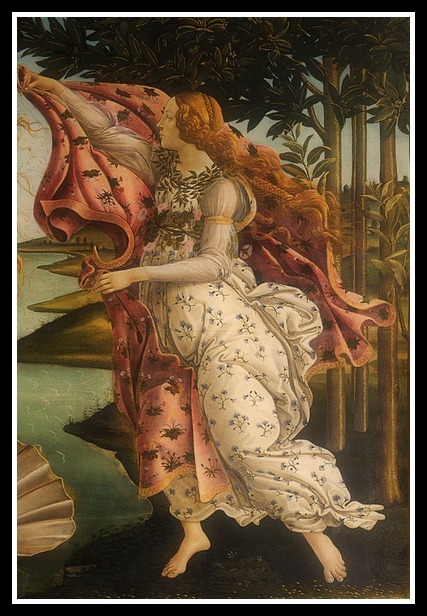 According to Botticelli, the woman in the flowered dress is Primavera (a personification of Spring thus probably link to Thallo) whose companion is Flora. The Three Graces accompanying her are being targeted by Eros (Cupid in Roman Mythology). 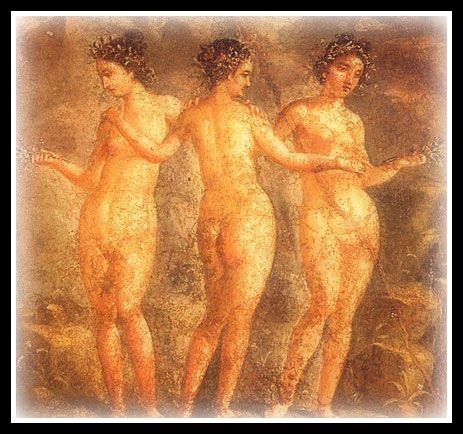 In Greek Mythology, the Three Graces represent beauty, joy and plenty. They are usually shown holding hands, smiling at each other or dancing, forming a close-knit group. Hermes, the Greek god of herds and herald of the gods, keeps the garden safe from threatening clouds. “Primavera” by Sandro Botticelli (1482). Details. 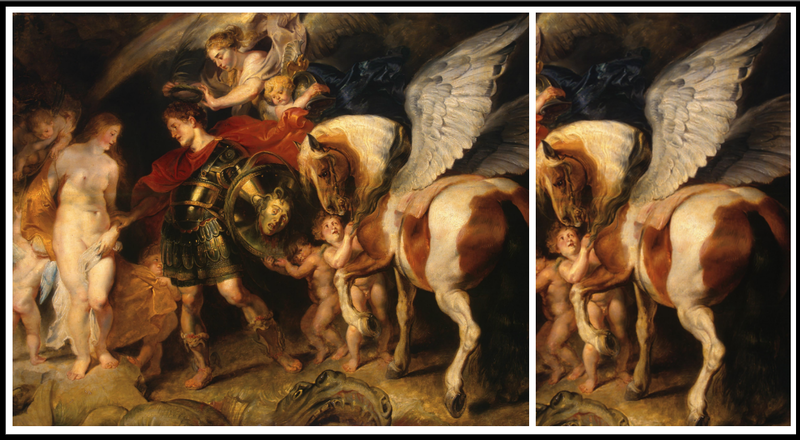 On the Left: Mercury (Hermes). On the Right: Chloris and Zephyrus. “Primavera” by Sandro Botticelli (1482). Details. On The Left: Flora, the goddess of flowers. In the Middle: Venus (Aphrodite) standing in her arch. 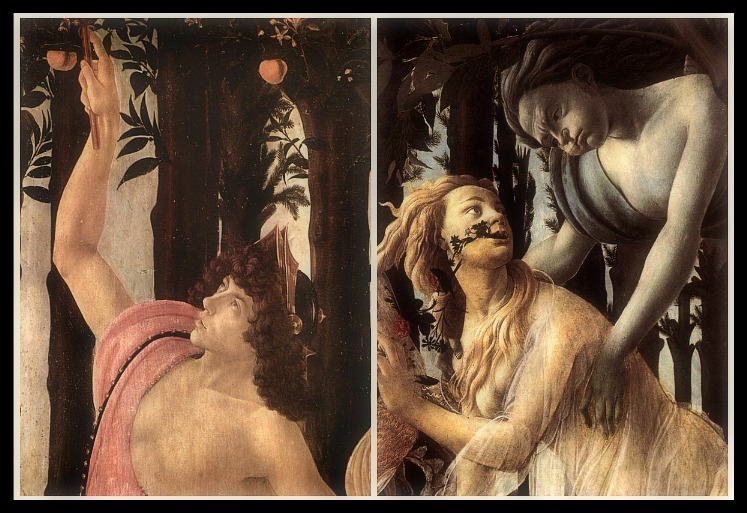 And according to Botticelli, The Goddess of Spring, which in Greek Mythology was one of the Horae: Thallo. On the Right: The Three Graces. 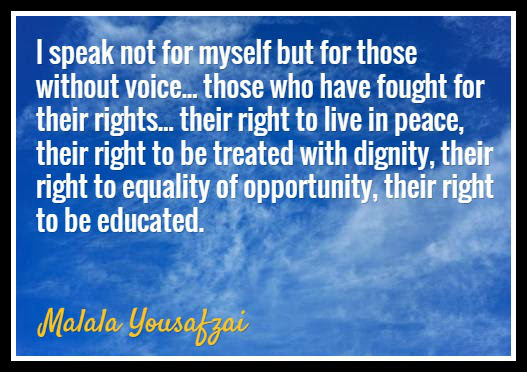 I want to thank Christy Birmingham for letting me be part of her very special tribute to Malala Yousafzai… A girl who is an example of resistance and overcoming, who fights against extremism and inequality and who has recently become the youngest ever recipient of the Nobel Peace Prize. I have been invited for this Blog Hop by Kevin from Kev’s Blog and by Inese from Inesemjphotography. So, with that purpose, I took some photos and attached them below. 1) Verónica from “En Humor Arte” 2) Irina from “Irina’s Poetry Corner” 3) Dulcinea from “Hodgepodge4thesoul” 4) Angie From “Family Life is More” 5) Francis from “Qhapaq”.